Although I know more people bought the kit than sent in pictures of projects, I am excited that three people chose to submit their project for the challenge. I can see from the pictures sent and comments made with them, that you guys really did find this out of your norm and it did stimulate you to do something different. I find it thrilling to think that it did that. The pictures of the challenge submissions have been posted in the gallery on the store's website. When you click the link, it will give you thumbnail pictures. Open the first one and then you can select 'next' and go through each page of the submissions. I'm glad I was not the judge. I would have had a REALLY hard time deciding. I found it interesting that everyone did an album of some sort. I guess with that many papers in the kit, it lends itself to those. We asked someone who is not affiliated with the store, doesn't know any of the participants but is a scrapbooking person to judge. The winner (you thought I'd never get to this didn't you) is KIMBERLY. She is participant 1 in the gallery. CONGRATULATIONS Kim! The gift certificate will be waiting at the store for you! Thanks to all who did the challenge! The Kit for August has a theme of Celebrating Summer. The colors remind me of summer. They would work for any type of layout or project, but to me the colors look like summer times: back yard bar-b-ques, family get-togethers, a day at the lake, celebrating a special person or a birthday or an anniversary. I hope the kit inspires you to make something...maybe to even make something you haven't made before. 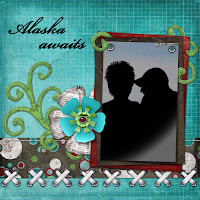 For August, we will do a give-a-way of a September Kit (approximate value $25.00) to the winner. I will draw a name from all of those who submit their project or layouts. I want to remove the excuse some people might use-thinking "oh it is not good enough & will never win". All submissions have an equal chance of winning. :) Stop by the store and pick up a kit or buy it on line here. Submit your pictures to us by midnight August 30, we will draw the name and announce the winner September first right here on this blog. (there are a couple of the July kits left too, if you wanted one) Here is a picture of the August Kit. This time, we will post some ideas the design team came up with to use elements of the kit. I hope they will spark some ideas for you. Feel free to use any ideas from these in your projects if you want. Come up with something totally new if you want. For September, we will be putting together actual project kits as well as the paper kits, so stay tuned. Also, there are a BUNCH of classes and crops going on in August and September. Check them out here. Hope to see you soon! Hope to see a creation made by you soon as well! Email them to carolyn@thecraftyscrapper.com. I am at home today getting my homework done for my upcoming trip to Utah CKU. It is not like me to procrastinate...but I guess I did because I leave next week and I am just now starting my homework. I am taking a digital class and the pre-work is necessary in order to get everything done during the class time. I came across this photo that my son-in-law took as we were leaving Seattle. I just LOVE it. I slipped it into a Quick Page template and 2 minutes later - here is the layout. Today, I am also working on my challenge for the store. I can't wait to see what everyone does with the same materials. Well another season of T-ball is over, this is my favorite sport to watch my son play. For over 3 years my friend Paige and I have made little keepsakes for the moms to have. Our kids have played soccer, basketball and t-ball together since they were 3 years old. This is what I came up with for the T-ball party this season. 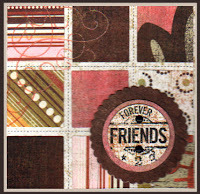 I used Simply Luxe paper, stamps from Maya Road, alpha stamps from the new Studio G $1 stamps, real simple and quick! Pictures of projects have begun to come in. I can't wait until we can reveal them and announce a winner of $25.00 at the Crafty Scrapper. Kits for August are ready too, and those will be shown on the first as well as the projects from July's kit. There is still time to pick up a kit and participate in the challenge. All details are right here. Check it out and Stay Tuned for exciting news coming Friday. Have I said that I love this line? I was just totally inspired by the vintage feel. It went perfectly with all my heritage photos of my mom as a little gal and her family. (Don't tell her I called her picts heritage! I have a very young mom!) I just got back from visiting my MIL and she gave me some great photos to scan of my husband's family! They are so cool. So be on the look out for my pig farmer lay out coming soon! Have you looked at the sheer albums and keychains and although you liked them, you just didn't quite know what to do with them? Do you wonder what will stick to them, what won't, what techinques work, what don't? Well, Annette has put together a great class to help you out. There are some tricks to using these albums, but you will pick them up quickly in this class. This album makes you happy just looking at it! Cosmo Cricket's paper Hello Sunshine is so happy and summery looking. 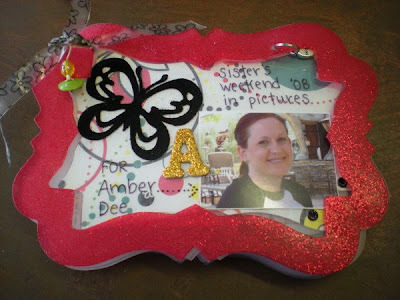 You'll add a few trinkets, do a little embossing, and WA-LAH!...A fabulous mini-album to add your treasured photos to. Embossing? Have you tried it with the sheer items yet? Well, there are some tricks to keep the sheer material from bending or bubbling. Make sure you call the store and get signed up for this class. It is happening July 31 and August 2 at 10:30 am each day. The cost is $35.00 and this includes all of the supplies to make the book. You just have to bring your class kit (scissors, cutter, pencil, adhesives-especially a good tape runner) and a Crop-a-dile if you have one. Today was Heidi's birthday as you see below. Thought we'd just post a couple more good pics. Notice that she didn't spit on the cake as much as Joanna did trying to blow out her candles. Of course, these were the nice, simple kind of candles that blow out easy, not the sparklers that won't blow out without gale force winds...hahahaha. Just one more example of a fun day at the Crafty Scrapper! I just want to thank you guys for my celebration! And Cheryl and her hubby, thanks for hanging w/us and singing! It was a great day; for having a Tuesday birthday, we had awesome food... funny (2thextreme-Sherri), awesome and purposeful gifts (hard 4 the girl that has everything!!!!) You guys SOOOO rock. I am so glad to have you as my friends! Today was Heidi's birthday and she didn't want the day off......so she spent it with her Crafty Scrapper family, lunch, cake and some goodies. We are lucky to have you, welcome to the 40's! Because I Couldn't Help It! I love the Graphic 45 and wanted to share this LO. 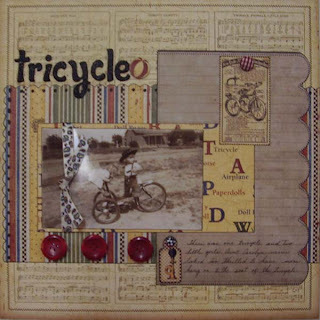 What do you do when there is one tricycle and 2 girls? Taking turns doesn't work when one can't reach the pedals! LOL! I have always loved this picture. I am so glad I was able to find the pirfect paper for it. Everything else- you guessed it....Graphic 45. There are only 4 kits left -- so if you were wanting one, you might want to head on down to the store or call and order it for shipping. The response has been even better than we hoped, so next month we'll up the amount of kits we make. We will continue to have kits and hopefully, have some more challenges with them. I hope it is a fun way for people to combine things they might not have before, find papers they didn't know about and to learn techniques from each other. Read the details here for this month's challenge. All I can say is this Graphic 45 is just too awesome for words. I have some great pict of of my mom and aunt when they were little. This is my aunt. I also added a Prima journaling page and some Maya Road ric rac, and some Thickers (which are on sale at the Crafty Scrapper). No Frill Crops at the Crafty Scrapper are anything but no frills! We had the best time last night! It was even more special because it was our friend Joanna's b'day celebration. Here you can see her TRYING to blow out the candles of the cake Heidi is carrying as Debbie and all the other gals sing and look along. I really felt the creative juices flowing. I made a book for a class I will be teaching. I did the challenge that Sherri posted earlier! What fun! And made 4 LOs with some fabulous new paper from Graphic 45. I will be posting those later! I admit it - I am fickle. If there is a new paper line - well that's all it takes - it is my new favorite. I am not sure if this Basic Grey is all that new, but I am totally truly madly in love with it. I also want to give a shout out to Cosmo Cricket too because I am two timing Basic Grey these days with Cosmo. This card is truly easy breezy. I created a grid with my computer and then just adhered squares of the different papers. 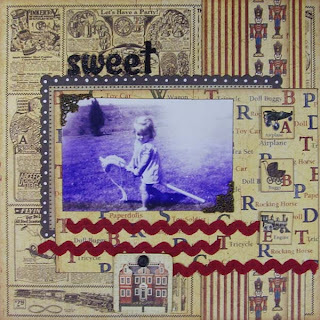 A layered and stamped sentiment, and I was done. It took my longer to think it up than to execute it! Is it a paper-sickness? Maybe. I'm ok with that. Last week we told you that we would have a challenge of sorts and details would come out on the 15th. Today is the day! We have put together a summer Summer Birds and Butterflies Kit of 8 papers, 5 ribbons, letter stickers, a stamp, buttons, brads Maya Road jewels and birds on branches. Also included is a vintage fold a note and bird cards. All of this is packaged and for sale at the store. Most of it is also available separately at the store as well. We are hoping that something in this broad array of items will call to you. It looks much better in person, but if you cannot pop by the store-the picture is here. If you want to order the kit-send an email to the store indicating you would like to purchase the July kit. Cost is $18.99. Shipping would be additional and is actual shipping costs. What we would like to do is to challenge anyone/everyone to use this group of supplies and show us what the end result is. A couple of the design team members will also participate, but will not be eligible to win the prize we have set up. I didn't want them to post their ideas at this point, because I'm anxious to see what everyone comes up with for this individually-I think that it is so fun to see what everyone comes up with using similar/same supplies. To show us your work either put a comment here with a link to your work or email it to carolyn@thecraftyscrapper.com. Put 'July Challenge' in the subject line of the email. 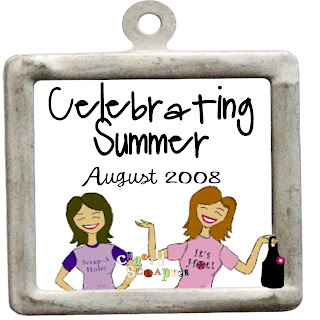 We will review all submissions on July 31 (so have your picture to us or tell us where to find it by Midnight July 30)and announce the winner of a $25.00 gift certificate to the Crafty Scrapper on August 1, 2008. The Fine Print: Projects may be layouts, altered work, books, etc. Decision made by the judges is final. By submitting you allow us to post your work on our blog and you allow us to ooo and ahhh as necessary. If you haven't checked the events page or gotten your email, here is the skinny on the Maya Road Class. Caroline is coming back and teaching two classes filled with new stuff from their summer CHA release. 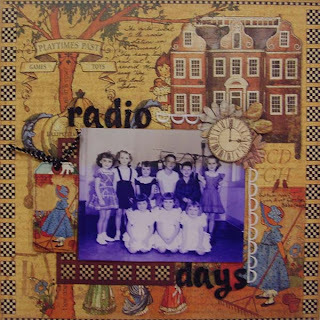 Saturday, August 16th, first class is their adorable chipboard tree album noon-2pm. Second class is a mixture of their 5 ring round sheer album and chipbard album called summer time 3pm-5pm. Each class is $50, if you sign up for both you will receive $10 off and goodies from Caroline from the summer show. I am sure you all have been looking at all the sneak peeks Maya Road has been showing, here is one of their new albums. As most of you know the convention was a little stressful, well Caroline from Maya Road sent me this album to cheer me up, and boy did it. With our new camper all I want to do is go to the Lake and scrapbook about it. Thanks Caroline for the album and all the great pep talks on balancing life. I still have a couple more pages to do, but I have had more fun doing this album, and notice all the Maya Road goodies inside. If you have not used their sheer journaling cards, you must, they make journaling fun! Also can you see Tim Holtz new metal embellishments? I added the keys to the ring and the hinges look like fish hooks. We leave for the Lake this Wednesday, and I have already started my new album for that. I am afraid the girls at the shop think I am never coming back, but I am still around and have a lot of things in the works. Don't forget to check out the 2 classes Caroline at Maya Road will be teaching at The Crafty Scrapper August 16th, you can see them on the events page of the website. Sign up soon it is filling up fast! 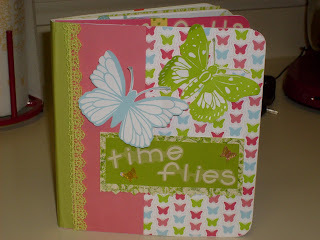 A book of seasons...is the name of this album that I made the other day at the Crafty Scrapper. The album is a sheer house from Maya Road. I really love the look that the sheers have when you place paper behind them. The papers I used today were mainly Creative Imaginations, but I also threw in some Flair and some K&Co papers. It is so easy to write on these sheers using a Slick Writer. And every once and a while, I have used some Icing from Glitz. Since I so do not have a house near the beach....I used the pictures of my Uncle Jim's family. He sent me precious pictures of his family all through the year on the beach. I hope you enjoy them. I hope you enjoyed the little journey through their year! We had another fun pre-teen crop. We made a mosaic frame to match our rooms. Everyone incorporated their own style to make their frames. We had a blast and the pizza pick of the day was sausage and cheese. Of course the Texas girls love their Dr. Pepper and Miss Carolyn brought delicious M&M cookies. We are having a blast with these young scrappers this summer! Having a fun time scrapping this summer! I have just been celebrating my boys accomplishments this year. I couldn't be any prouder of my Luke. Now...he is a good sport. Not everyone is used to their mother jumping coming up to them during a performance and taking a self portrait. (They were on the gym floor and the parents were leaving.) He is a really shy guy but I think he secretly likes it. This is a LO using Cosmo Cricket. The only hard time I had was deciding which side of paper to use because I wanted to use the reverse side or keep the saying on the reverse! Every inch of the paper is simply FABOO! A couple of weeks ago a good friend asked me to be apart of a Bunco group, believe it or not I have never played. I am also shy about going places were I do not know anyone, yes I know thats hard to believe, but its true. But I thought why not it would be good for me to meet new people. The first night was Luau night and you had to dress Luau and make a Luau dish. As my friend Marie has gotten me hooked on google, I found this recipe. 1. Cut chicken into bite-sized pieces. Wrap with about 1/3 slice of bacon, thread onto toothpick, and top with pineapple chunk. Marinate for 4 hours or longer in teriyaki sauce. 3. Place marinated appetizers onto parchment lined baking sheets. Bake for 20 minutes or until chicken is done and bacon golden brown. Drain on paper towels. Serve hot. With a little Kale and some bright summer flowers, you have a great Luau dish! I selected not to post a picture of my outfit, but I did actually win "best Luau outfit". I had a blast, and so enjoyed meeting new people....its good to step out of our confort zone. Now I have to come up with a theme for the night I host....any ideas? Sorry this is late but we have been on the lake with no phones or computers...so here is a little sparkle wishing you a Happy 4th, hope everyone had a great weekend! If you have been to the shop lately, you probably know that Nolan and I bought a camper last week. We have been saving for one and a perfect camper came our way. I was off to the dollar store (LOVE this place) bought everything we needed so we could always have it stocked and ready to go. Thursday we left for Big Brown to camp. We have always enjoyed camping in a tent, but at 40, we have decided it was time to move up to a camper. And after this weekend I am here to tell you I LOVE THIS CAMPER. We had so much fun we didn't want to come home. We swam, relaxed, ate, visited with friends and family and fished all weekend, at one point Nolan and I each had 3 fishing poles going. And of course Denton had his Superman pole! On Friday some family came out to visit and brought their boat. Michael, who owned the boat was Denton's new BFF. He rode that tube forever and was never scared. At one point his little body was bobbing up and down and I couldn't tell if he was OK or not, he then yelled "GO FASTER"! So now he wants us to save for a boat and tube, he says its better than Flip Fusion. People who know me, know that I grew up on the water. All my Uncles owned boats and raced them, I would spend all summer up at their house. I learned how to ski at 10years old and by 15 was doing tricks on a single ski. But that was 25 years ago and of course I was in better shape, so when I was asked if I wanted to ski, I thought "OH NO it will never happen!" Well guess what? YES I did it, and I even got up on the second try. I guess its like riding a bike, you do not forget. I will tell you that my ankles, back, legs, everything hurts today....BUT it was SOOOO worth it.